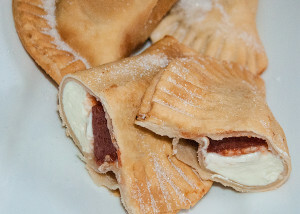 Place a slice of cream cheese and a slice of the guava paste (about an inch thick each) in the center of you cut out dough and with your finger wet the rim of the circle and fold the dough over. remove from the pan and place on a cookie sheet or paper towel and sprinkle with sugar on both sides. Let cool for a few minutes and serve warm.